(Phys.org) —A pair of researchers from the University of Edinburgh has found that a certain type of beetle mother engages in offspring cannibalism when pestered too much. In their paper published in Behavioral Ecology, Clare Andrews and Per Smiseth describe two experiments they conducted to learn more about the behavior mechanisms that are involved in mediating the resolution of parent-offspring conflict. Burying beetles lay their eggs on the remains of dead animals. When the eggs hatch, the mothers ingest parts of the carcass, digest them, then regurgitate some amount of what they've eaten into the mouths of their hungry offspring—as with other species, the offspring tend to beg for food (by manipulating her mouth parts with their legs) whenever the mother approaches. In this new effort, the researchers set out to discover how effective the begging strategy is for the offspring. In the first experiment, the researchers controlled the way food was doled out from mother to offspring by offering food from some mothers that were dead and some that were alive. At issue was which of the offspring would gain better access to the food source under the different scenarios. In watching the beetles at work, the researchers noted that the older offspring gained better access to the mouth parts of the parent, regardless of whether she was dead or alive. Indeed, they noted that the mother's that were still alive seemed to have a preference for feeding the older offspring. This finding suggests that the longer offspring last, the better chance they have of surviving into adulthood due to better access to food. In the second experiment, the researchers deposited an adult female and a very large number of offspring from other beetles onto a carcass to see how the mother would respond to the inevitable begging that would ensue. They found that the mother responded by killing and eating those offspring that begged the most. They also noted that if there wasn't enough food to go around, the mothers resorted to the same behavior regardless of how much the offspring begged. The researchers suggest that offspring that beg too much give mothers a way to choose how to best apportion resources—those that beg only when truly hungry are more likely to survive. Put another way, they suggest it's a means of mediating conflict resolution between offspring and parents. Understanding the behavioral mechanisms mediating the resolution of parent–offspring conflict is an important challenge given that the resolution of this conflict shapes the transfer of resources from parents to offspring. Three alternative models suggest that offspring begging provides an important behavioral mechanism for conflict resolution: honest signaling, scramble competition, and cost-free signaling models. However, there has so far been little progress in testing between these models because they share the same predictions. 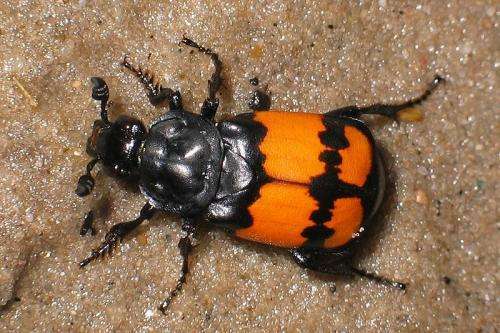 Here, we test between these models by focusing on their contrasting assumptions concerning who controls resource allocation and whether begging is costly in 2 experiments conducted on the burying beetle Nicrophorus vespilloides. In Experiment 1, we manipulated the degree to which offspring and parents can control resource allocation by presenting broods with age-based competitive asymmetries with a live or a dead female parent. We found that seniors (i.e., older larvae) gained more access to the parent's mouthparts than juniors only when presented with a live parent. In Experiment 2, we provided parents with broods of 60 newly hatched larvae and found that larvae were more likely to become a target of filial cannibalism when begging than would be expected if parents targeted larvae irrespective of their behavior. These findings suggest that offspring begging increases the parents' influence over food allocation and that begging is costly by increasing the offspring's risk of being a target of filial cannibalism. Our results support the assumptions of honest signaling models for the resolution of parent–offspring conflict. 1 - Is there a means for the mother to identify her children? 2 - Is ther a means for the children to identify their mother? Does an adopted baby bug beg more and thus find themselves more likely to be eaten? Does a mother bug preferentially eat babies that are not her own when they beg too much? Other than those two questions, liked the article, and the dry humor - "Put another way, they suggest it's a means of mediating conflict resolution between offspring and parents." Thanks all for your interest in our study! You are spot on 'Neurons_At_Work', the species is indeed N. vespilloides. 2) Offspring also have a simple rule for 'identifying' Mum - they can tell by the chemicals on a female's outer cuticle if she's in breeding condition or not, but we found that they couldn't distinguish their real biological mum from a foster mum (dx.doi.org/10.1093/beheco/arq019). Though it might at least allow offspring to avoid intruders who are likely to kill them!